That is causing all my pain. I said to my daughter-in-law Megan I can so understand why people in chronic pain commit suicide. (And no I don't feel suicidal just having a little pity session). Anyway yesterday I woke to it rainy and colder without the humidity and felt a 100% better. Today not so good. Anyway whine is over for now. This year has been so busy. Dad has been very unwell and I have spent some time in Perth with him. He has rallied a bit now after an iron transfusion that caused a little heart attack. I am off to Perth again on Thursday because Mum's best friend Rosie Brandis died suddenly and I am going to her funeral. It was a shock. She was a huge part in my growing up life in Mingenew. I have been stitching and crocheting away like nobody's business this year. I have had one finish with cross stitch another almost done. Just need to buy that silk thread so I can finish it. 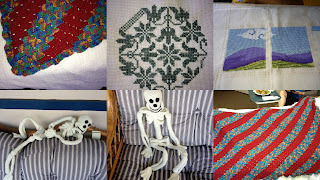 Also have finished a lap afghan on the crocheting bit and a skeleton. I will upload pictures when they are all transferred to my computer from my phone. Presently I am stitching on my Jim Shore afghan and have completed 2 of the squares. I need to get a move on with the 3rd square as it needs to be completed by the end of the month. I am also stitching away on a Jim Shores Monogrammed Letter "A". Don't think my girlfriend reads this blog as it is for her. Started this last year and didn't realise it was a detailed as it is. Still I am enjoying it immensely and hopefully it wont get put away before I finish it. I am also stitching on a band sampler called Evangeline. Yes it is named after my grand daughter. My dear friend Martina Dey designed it and then asked me to name it. I will put Evangeline's birth details at the bottom or in the middle as a birth sampler for her. I also have been looking at Martina's German site. It is fantastic and the designs in it are just gorgeous. Many more designs than available on the English sites. I love the animal ones. Anyway I think that is all I can think of. Well that is not true but I don't want to bore you to tears. Oh and Megan where is your update on the new chickens and chicken cage? I will edit this later when all the photos are downloaded. I think I have downloaded them before but I am not computer savy on a PC so can't be bothered looking for where they might be. Macs are so much better for finding things. From the top left hand corner is a view of the corner of the crochet afghan, the finished quaker motif, the 2 squares stitch on the Jim Shore afghan, Homer the skeleton I stitched for Kenric and lastly a full view of the afghan I crocheted.